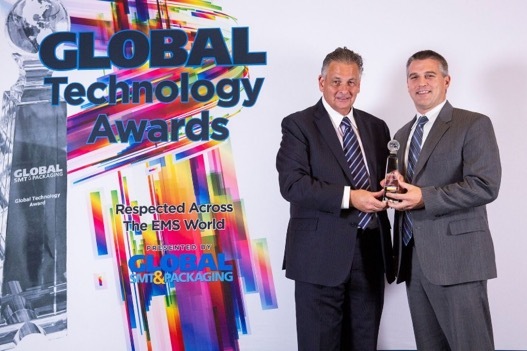 EAST AURORA, NY, October 30, 2018 – Astronics Corporation (Nasdaq: ATRO), a leading provider of advanced technologies for the global aerospace, defense and semiconductor industries, announced today that its wholly owned subsidiary, Astronics Test Systems, has received the Global SMT & Packaging Journal’s 2018 Global Technology Award in the test equipment category for its ATS 5034 System-Level Test (SLT) Platform. Astronics EVP, Jon Sinskie (right), accepted the award from Global SMT & Packaging Editor-in-Chief, Trevor Galbraith (left). Featuring the ability to test up to 5,000 units per hour (UPH) on 396 sites in parallel, the 5034 SLT can be customized for specific volume, test time, lot size and thermal needs. The platform supports testing of microprocessors, microcontrollers and embedded systems, including devices in today’s most advanced types of packaging. Intended for the automotive, mobile and desktop device, Internet of Things, aerospace, and biomedical industries, the ATS 5034 SLT Platform can lower the cost of test, increase operational efficiency and maximize test coverage. Astronics Test Systems will exhibit at ITC this week in Phoenix, Arizona in booth 500. As a sponsor of the conference and the Automotive Reliability and Test (ART) Workshop, the company plans to attend a variety of technical sessions, as well as co-author a poster presentation at the ART Workshop, “Test cost and test quality: key factors for automotive monster-chips.” For complete product details, to view the solution sheet or to request a quote, please visit Astronics.com. Astronics Test Systems leverages nearly 60 years of experience to offer automatic test expertise to electronics manufacturers in the aerospace, military, semiconductor, medical, space, mass transit and automotive industries. Astronics’ test solutions ensure the world’s most advanced electronic products perform as designed, every time.